Acne is caused by excess oil production that clogs the hair follicles with oil and dead skin cells. This trapped oil causes bacteria to form which causes the inflammation responsible for pimples, whiteheads and blackheads. Acne is a common skin disease that doesn’t discriminate and affects people of all ages and races. While most commonly associated with puberty and teenagers, men and women of all ages may experience acne at some point in their lives. Hormonal fluctuations, common throughout different life stages, may exacerbate breakouts. At EverYoung Medical Aesthetics, we offer multiple solutions to help clear acne, blackheads and whiteheads from the face, forehead, chest, upper back and shoulders. Depending on the severity, our medical doctors may prescribe a single or a combination therapy to help clear acne and reduce inflammation in your skin. These preventative measures are just a few ways to prevent breakouts. Individuals who practice these steps and are still experiencing acne should consult with a specialist and inquire about BLU-U Acne therapy. Before scrubbing your face with an abrasive product, washcloth or pad, understand that doing so can actually spread the acne causing bacteria. BLU-U Acne therapy uses a blue light that kills the p. acnes bacteria responsible for pimples and clogged pores. Regular treatments shrink the sebaceous glands so that less oil is produced; helping to clear away existing acne and lessen future outbreaks. Treatments are easy and painless; the patient wears protective goggles to protect their eyes (much like sunglasses for the sun, although blue light is cool not hot) and sits in front of the BLU-U device as it emits a bright blue healing light. When it comes to battling acne there are many approaches to take, but finding the one that suits your individual skin is key. 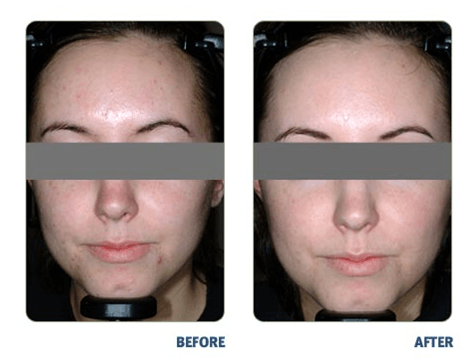 For mild to moderated cases, BLU-U Acne Therapy is quite effective. This procedure is a comfortable and effective way to start clearing your skin of blemishes.